2The Court of Appeal has ruled that Century 21 Australia’s arrangements permitting Victorian Realty Group to trade as “Century 21 Complete Properties” was a franchise agreement for the purposes of the Estate Agents Act 1980 (Vic.). One of the reasons this is significant is that each party to the franchising agreement is jointly and severally liable for any defalcations, or negligence, by the estate agent : s 43. Victorian Realty Group (VRG), while trading as “Century 21 Complete Properties” in Craigieburn, had committed a number of defalcations which resulted in 13 of its clients losing money. Those clients were compensated out of the Victorian Property Fund. The Secretary brought proceedings against Century 21 Australia, the franchisor1 under s 43 to recover those payouts. Under the terms of the franchise agreement, and the incorporated Policy and Procedures Manual, Century 21 Australia granted VRG the right and obligation to trade exclusively under the name Century 21 Complete Properties. There were other rights and obligations to use “Century 21” in the various ‘trademarked’ forms, and to use various systems and participate in the Century 21 marketing plan. In other words, you and I would consider it a pretty typical example of a franchise arrangement. The trial judge, however, found that the arrangement was not a “franchise agreement” as defined in s 43 because of the words in the definition “under that name”. VRG was authorised only to carry on business under the name “Century 21 Complete Properties”, not just “Century 21”; and “Century 21 Australia”, the franchisor, did not carry on business under that name. 50 In its written case, the respondent seemed to accept that the Franchise Agreement was an agreement that would ordinarily be described as, and understood to be, a franchise agreement. The respondent’s written case described the Franchise Agreement as ‘the unambiguous franchise agreement in this case’. That description was, with respect, apposite. While that description does not relieve the Court of its obligation to properly construe and apply the definition of ‘franchising agreement’, it brings into focus the question of what legislative purpose might possibly exist in differentiating between franchise agreements that have different provisions as to trade names and the terms upon which their use is or is not permitted. That said, it is of course the text of the statutory definition that is paramount in the resolution of this proceeding. 51 ‘Century 21’ is a name. Equally, one might describe the relevant circumstances in this case as involving the use of a name being ‘the Century 21 name’. When one examines the Franchise Agreement (including the P&P Manual) it seems to us that that agreement authorised VRG to carry on business under the name ‘Century 21’ or the Century 21 name. Like any franchise agreement, it did so on particular terms. We have already set out the relevant terms in the present case. The existence of those terms does not gainsay the fact that the Franchise Agreement was one which authorised VRG to carry on business under the Century 21 name. 52 Similarly, in our view, the International Agreement entitled the respondent to carry on business under the name ‘Century 21’ or the Century 21 name within the meaning of the statutory definition. In our view, this conclusion accords with the text of the definition construed, as it must be, in its context and by reference to the legislative purpose of the provisions of the Act. Century 21 Australia had been appointed the master franchisee for Australia by Century 21 International with powers to appoint and manage “Century 21” franchisees here. ?? Mortimer J has dismissed Shape Shopfitters claims against Shape Australia for misleading or deceptive conduct, passing off and trade mark infringement. Much of the focus of the decision is on the misleading or deceptive conduct claim (and will have to be the subject of a future post). This post will look at the trade mark infringement claim. Shape Australia provided construction services, apparently on a much larger scale, but was not specifically engaged in shopfitting – sub-contracting out those parts of its jobs. Also, Shape Australia did not provide its services to the particular people who were customers of Shape Shopfitters. Mortimer J found that Shape Australia’s trade marks were not deceptively similar to Shape Shopfitters’. Her Honour considered that the imperfect recollection of the relevant public would recall not just the word SHAPE, but also its collocation with the word Shopfitters (albeit it was subsidiary) and the distinctive “bottle cap” shape of the border. The use of capitals for the word “SHAPE” in the applicant’s Mark is, I accept, a feature likely to be recalled. In part, it is the use of capitals which is likely to make the word “shape” stick in the memory, as well as its proportionate size in the Mark. It is also correct that the word “Shopfitters” is much smaller, as is “Est 1998”. I see no basis to find that the latter phrase would be generally recalled, however I consider the word “Shopfitters” may well be recalled in conjunction with the word “SHAPE”. There is an alliterative effect between the two words, as well the positioning of “Shopfitters” underneath the word “SHAPE”. An industry participant’s eye (to take the applicant’s wider class of people) will, in my opinion, be drawn to that word as well and what is just as likely to be recalled is the phrase “SHAPE Shopfitters”, rather than just the word “SHAPE”. As a result, the prospect that the word mark would be deceptively similar was roundly dismissed. The two devices with the word in a circle were closer, but the absence of the word Shopfitters and the difference between a circle and the “bottle cap” border were decisive. The Circle Mark and the Transparent Mark have a closer similarity, because of – in combination – the use of capitals of the word “SHAPE”, the placement of that word inside a circle, and the use of a circle itself. However, as I have set out, in my opinion even imperfectly, a reasonable industry participant of ordinary intelligence and memory is likely to recall the word “Shopfitters” in conjunction with the word “Shape”, especially because of the alliteration involved. I also consider such a person will recall the applicant’s Mark has a distinctive border that is not a smooth circle. I do not consider the evidence about several industry participants referring to the applicant as “SHAPE” affects these findings in a way which means that word would be recalled as the only essential feature of the applicant’s Mark. Rather, that evidence is evidence of the contraction of the applicant’s business and trading name in ordinary speech, and such a contraction does not necessarily carry over to what a reasonable person is likely to recall of the applicant’s Mark. It goes only to how industry participants might refer to the applicant in conversation. Given these findings, it was unnecessary for her Honour to express an opinion on whether the registration of Shape Shopfitters’ trade mark with the blue background imposed a limitation on the scope of the registration. Mortimer J’s conclusions do not explicitly turn on the fields of activity of the respective parties, apparently a closely fought battle in the context of the misleading or deceptive conduct case. Indeed, at  her Honour expressly said it made no difference whether the relevant public was defined as the “buyers” of construction services or participants in the commercial construction industry. Although Shape Australia was much larger than Shape Shopfitters, you might recall that for much of its life it had operated under the name ISIS Group Australia and had changed its name after Shape Shopfitters came on to the scene and the name of the ancient Egyptian goddess took on some rather unfortunate (to say the least) connotations. ? Referring to s 70 read with the definition of “limitation” provided by s 6. ? Should Michelin’s X block Continental’s Xking? Over at the IPKat, there is a report about a CJEU decision upholding Michelin’s opposition based on its “X” trade mark to the registration of Continental’s “XKING” mark (below on the right), both in respect of tyres. You should read the report, if for no other reason, than the revelation of the EU’s “scientific” approach to trade mark conflicts. The end result here is that one trader with a weakly distinctive trade mark for the single letter X, distinguished from the letter of the alphabet only by the merest stylisation, can prevent the registration (and potentially use) of a stylised mark XKING. It must also follow that the same trader can prevent other X-formative marks, especially if the other element is in some way laudatory (and the word “king” is hardly at the top of the laudatory scale). Might it be said that this hands too strong a right to the trader? They will compare the actual mark which they see upon goods which are offered to them with the memory of the other mark, which they will retain in a more or less distinct form… The court must endeavour to put itself in the position of ordinary purchasers of goods who have noticed a trade mark as being distinctive of particular goods, but who have not compared that mark with any other mark, and who are quite probably not aware of the fact that another more or less similar mark exists. If you’re really motivated, leave a comment explaining why! Jafferjee v Scarlett  HCA 36; 57 CLR 115 at 122. ? The USPTO has published a report on its public review of the rules patent eligible subject matter under US law – what we would call a “manner of manufacture”. The Report does not appear to be the US Commissioner’s recommendations, but rather the results of consultations with the public. As the Report notes, it is widely accepted in the USA that the Supreme Court’s decisions between 2010 to 2014 in Bilski, Mayo, Myriad and Alice have substantially altered what is patentable subject matter under US law and what not. The most dramatic effects being experienced by the life sciences and computer-related technologies. According to these participants, the Court’s precedent is having such a harmful impact on innovation and business development that a legislative solution is critical. …. There appears to have been rather less uniformity about what the legislative solution should be. Some submissions called for a legislative requirement only that the claim be for a technological or useful art, without a requirement for “newness”. Some submitted that the requirement should be something having a practical application. can be performed solely in the human mind. Some submissions called for the legislation to make it clear that patent eligibility is a separate requirement to the other requirements such as novelty and obviousness, and to be considered separately from those requirements. Several commentators thought that the problem of “pre-emption” could be addressed by introducing a specific exemption from infringement for research. Our High Court in its own Myriad decision managed to adopt an even more alarming approach to patentable subject matter notwithstanding that Parliament had introduced an explicit research defence in s 119C. While it would appear likely to be some time before a clear solution emerges in the USA, maybe these developments should also give us pause for thought, given how enthusiastically the Patent Office and, under its guidance, the Full Court has jumped on the Alice type bandwagon, albeit drawing on the even more curious European approach. Patents Act 1990 s 18(1)(a) ? That is, “concerns that patents on foundational technological tools may stifle scientific progress by tying up the basic building blocks of human ingenuity”. ? 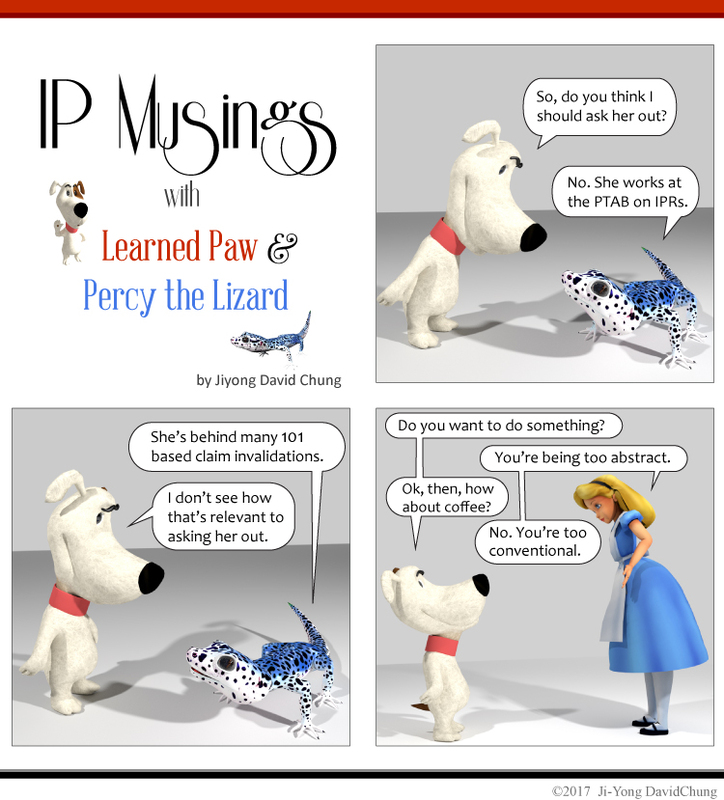 For a rather more humorous take, see IP Musings. ?